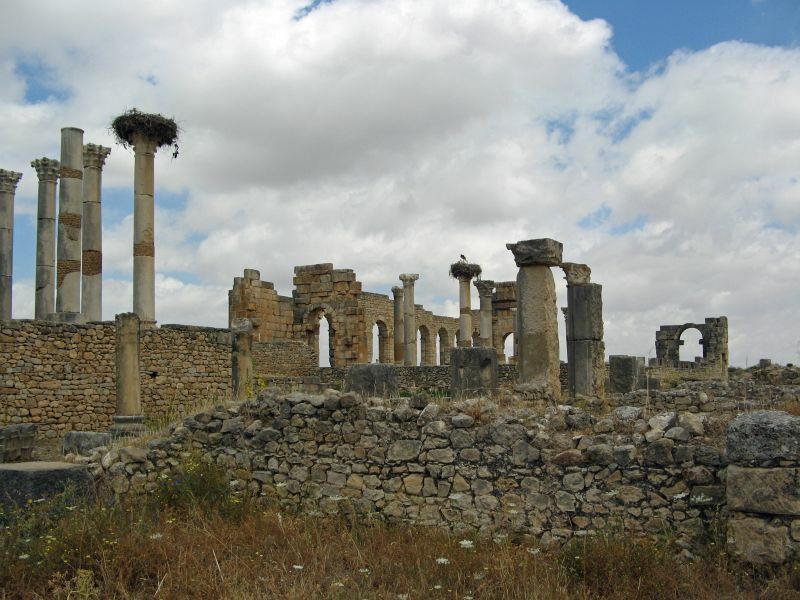 In June 2009 I made a trip in Maroc and visited the old ruins of Volubilis. 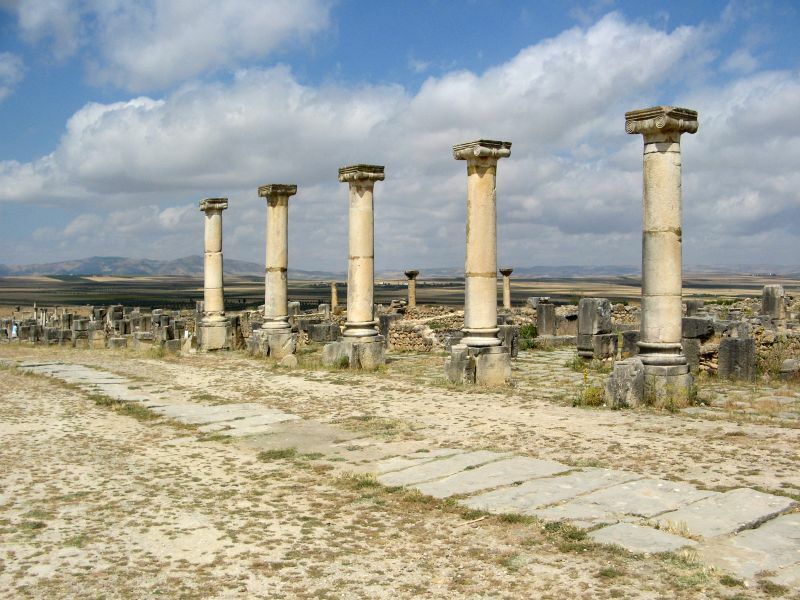 Volubilis is a partly excavated Roman city in Morocco situated near Meknes between Fes and Rabat. 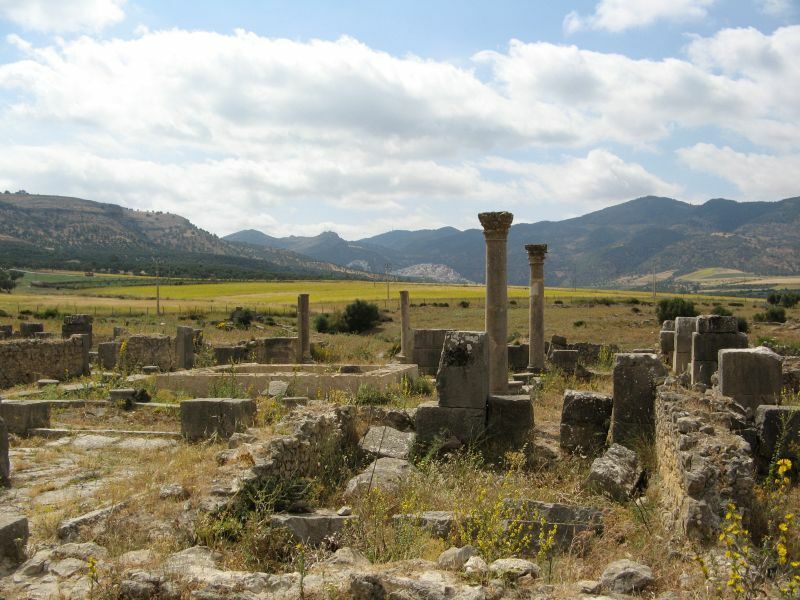 Built in a fertile agricultural area, it was developed from the 3rd century BC onwards as a Phoenician (and later Carthaginian) settlement. 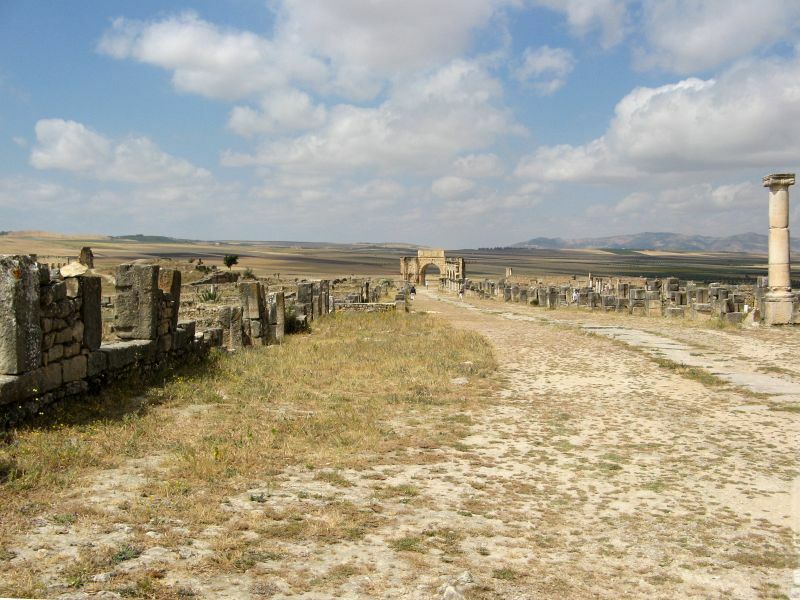 It grew rapidly under Roman rule from the 1st century AD onwards and expanded to cover about 40 hectares (100 acres) with a 2.6 km (1.6 mi) circuit of walls. 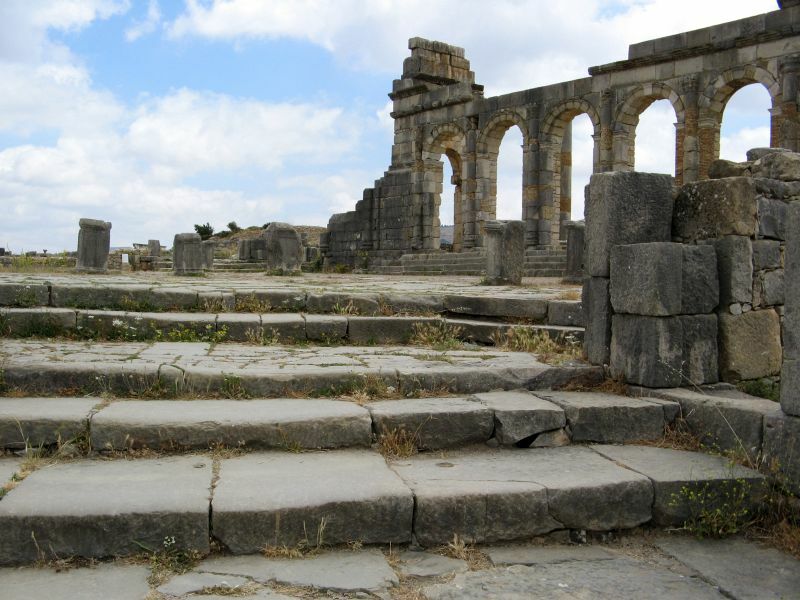 The city gained a number of major public buildings in the 2nd century, including a basilica, temple and triumphal arch. 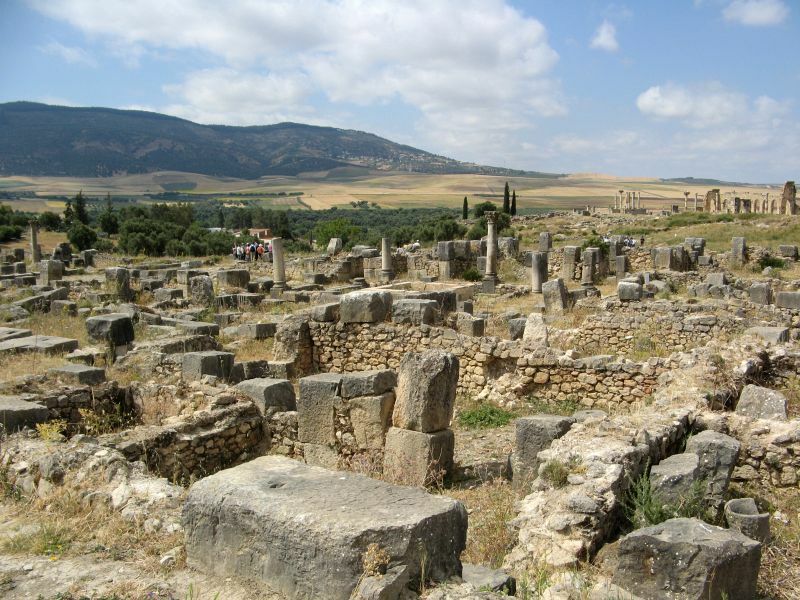 Its prosperity, which was derived principally from olive growing, prompted the construction of many fine town-houses with large mosaic floors. 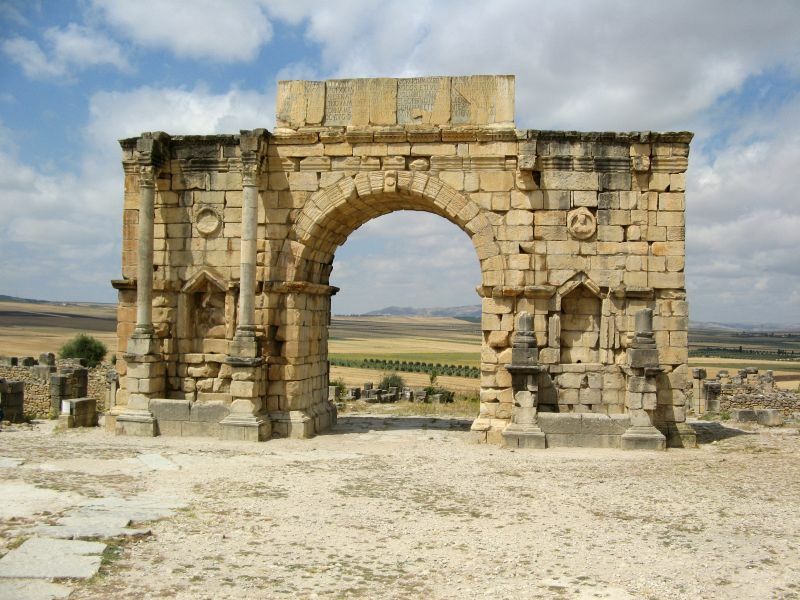 Although only about half of Volubilis has been excavated, a number of prominent public buildings are still visible and some, notably a basilica and a triumphal arch, have been reconstructed. Many private buildings, including the mansions of the city’s elite, have also been uncovered. 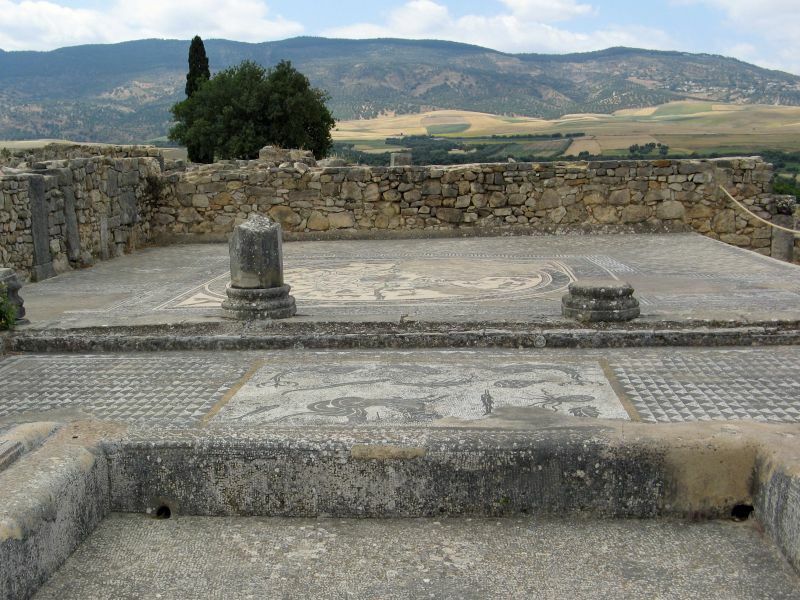 They are especially notable for the fine mosaics that have been discovered in a number of buildings and which are still in situ in the houses where they were laid. The buildings were mostly made from locally quarried grey-blue limestone.Very little remains of the original Punic settlement, as it lies under the later Roman buildings. A large tumulus of uncertain origin and purpose stands approximately in the middle of the excavated area, between the old and new parts of the city. Two major public buildings are readily visible at the centre of the city – the basilica and the Capitoline Temple. The basilica was used for the administration of justice and the governance of the city. 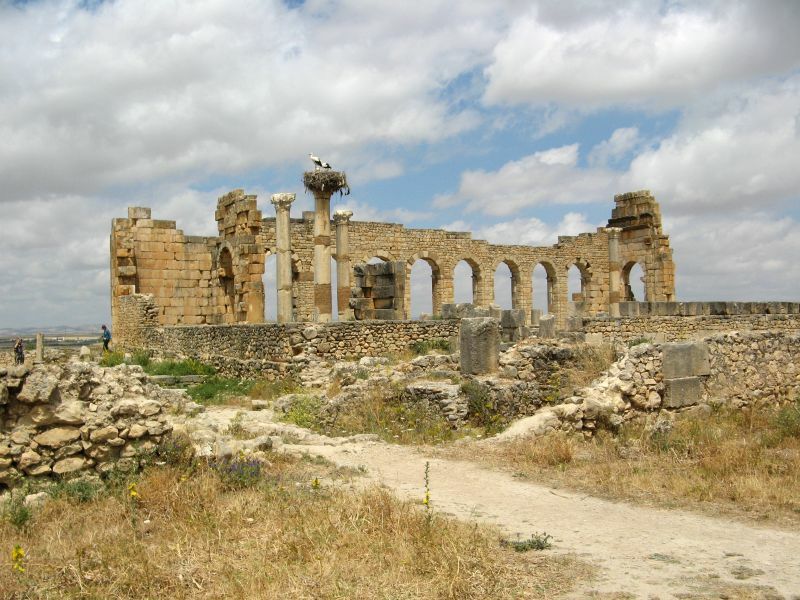 Completed during the reign of Macrinus in the early 3rd century, it is one of the finest Roman basilicas in Africa and is probably modelled on the one at Leptis Magna in Libya. The building is 42.2 m (138 ft) long by 22.3 m (73 ft) wide and originally had two storeys. Its interior is dominated by two rows of columns framing the apses at each end of the building where the magistrates sat. The outer wall of the basilica, which is faced with columns, overlooks the forum where markets were held. 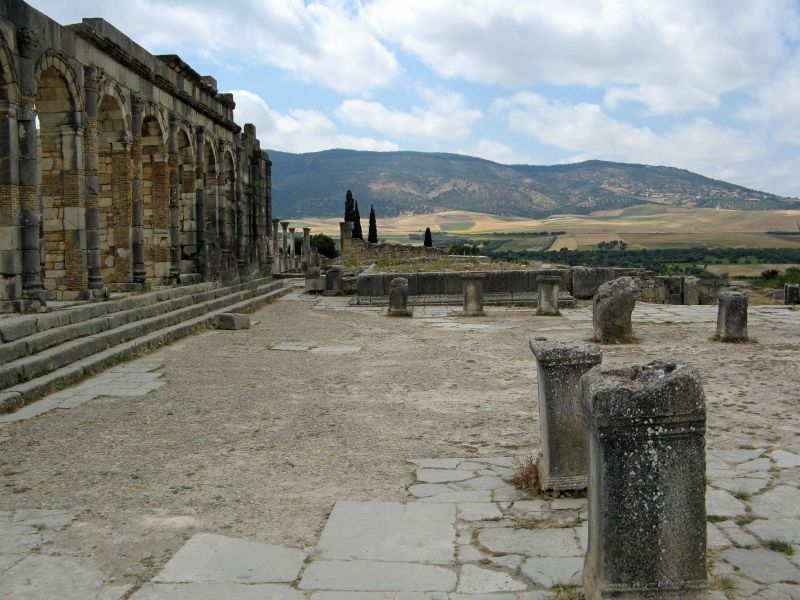 Small temples and public offices also lined the 1,300 m2 (14,000 sq ft) forum, which would have been full of statues of emperors and local dignitaries, of which only the pedestals now remain. 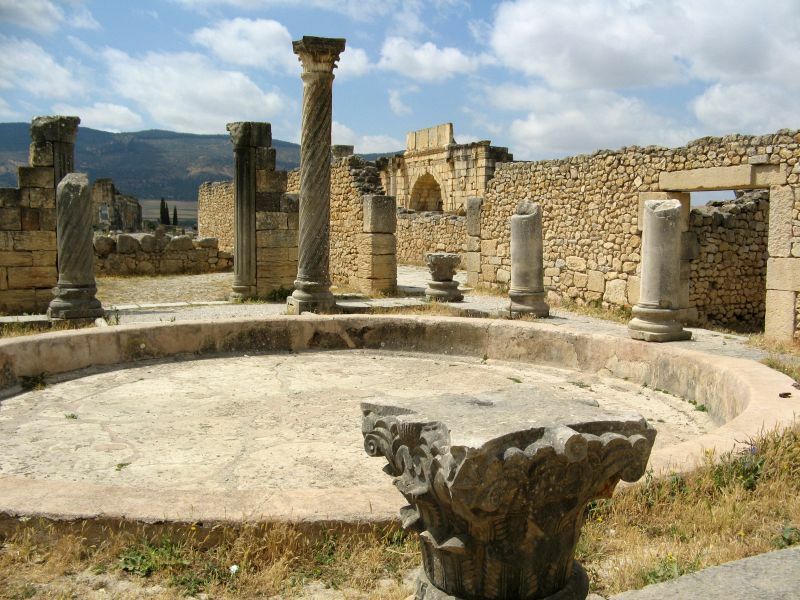 Not much is known about the public buildings which existed in Volubilis prior to the start of the 3rd century, as the buildings currently visible were built on the foundations of earlier structures. The Capitoline Temple stands behind the basilica within what would originally have been an arcaded courtyard. An altar stands in the courtyard in front of 13 steps leading up to the Corinthian-columned temple, which had a single cella. The building was of great importance to civic life as it was dedicated to the three chief divinities of the Roman state, Jupiter, Juno and Minerva. Civic assemblies were held in front of the temple to beseech the aid of the gods or to thank them for successes in major civic undertakings such as fighting wars. 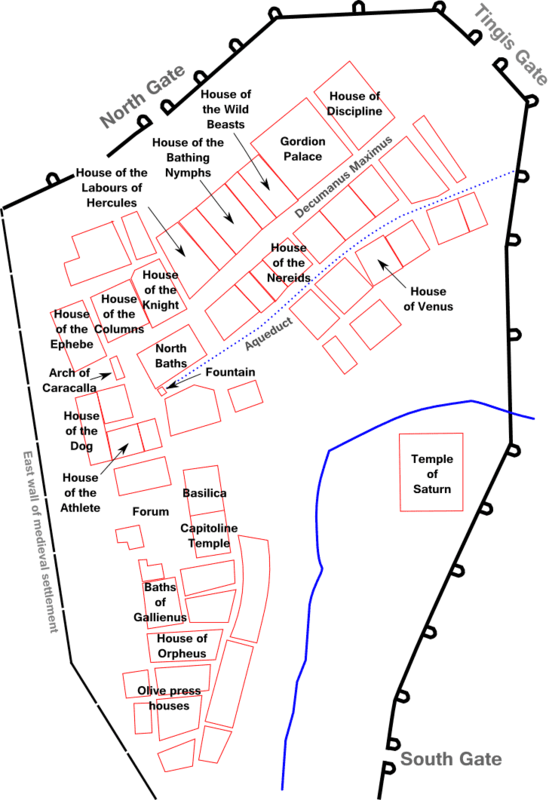 The layout of the temple, facing the back wall of the basilica, is somewhat unusual and it has been suggested that it may have been built on top of an existing shrine. An inscription found in 1924 records that it was reconstructed in 218. It was partly restored in 1955 and given a more substantial restoration in 1962, reconstructing 10 of the 13 steps, the walls of the cella and the columns. There were four more small shrines within the temple precinct, one of which was dedicated to Venus. 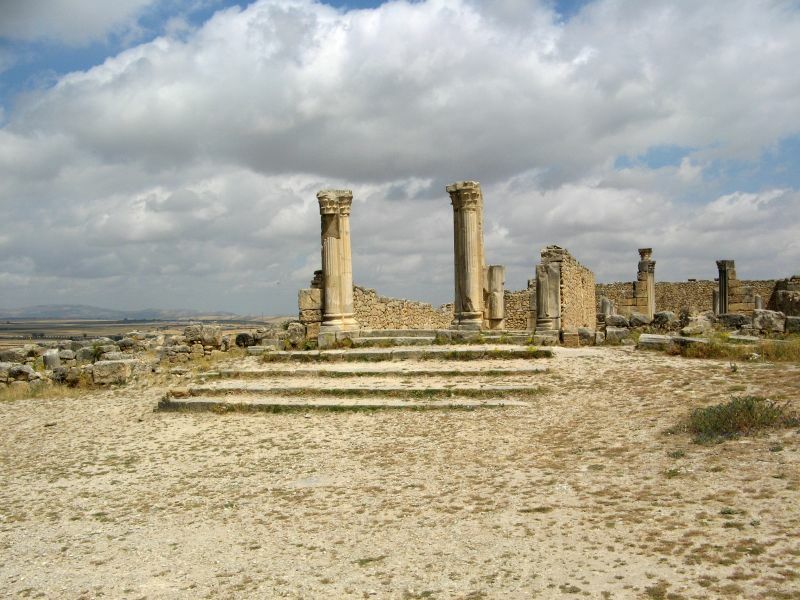 There were five other temples in the city, of which the most notable is the so-called “Temple of Saturn” that stood on the eastern side of Volubilis. 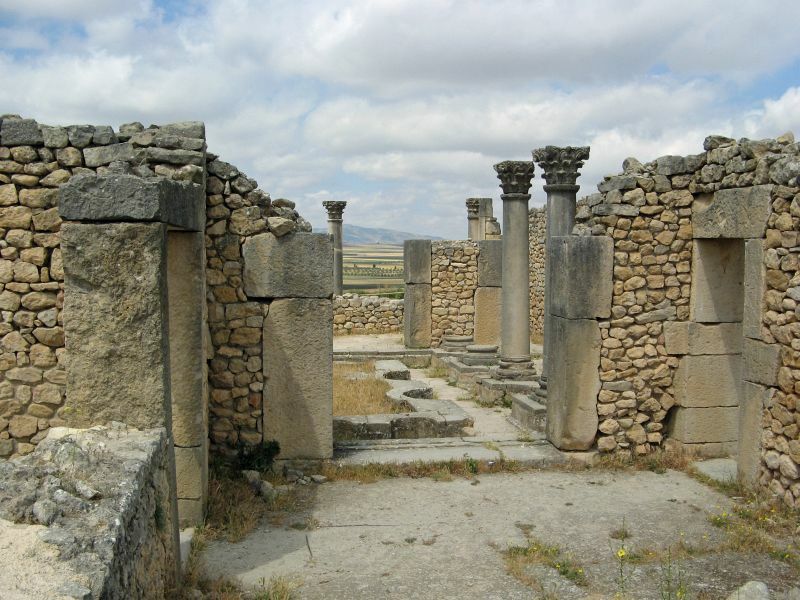 It appears to have been built on top of, or converted from, an earlier Punic temple, which may have been dedicated to Baal. It is a sanctuary with a surrounding wall and a three-sided portico. In its interior was a small temple with a cella built on a shallow podium.